Our family continues a proud tradition of warm hospitality, offering quality accommodations at affordable rates. 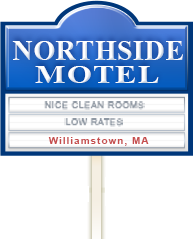 The Northside Motel is ideally situated in the heart of Williamstown. The Williams College campus is located directly across the street, Williamstown Theatre Festival is only a half a block away. The Sterling and Francine Clark Art Institute, The Williams College Museum of Art, The 62 Center for Theater and Dance shopping and restaurants are all within very easy walking distance. We are only 10 minutes from the MASS MOCA Museum of Contemporary Art in North Adams. We are also within 15 minutes of Jiminy Peak Ski Resort and the Mount Greylock State Reservation. Children under 12 stay for free. Newly renovated in May 2016!!! Chance moderate rain showers and isolated thunderstorms.